mainly macro: Has the Great Recession killed the traditional Phillips Curve? Has the Great Recession killed the traditional Phillips Curve? Before the New Classical revolution there was the Friedman/Phelps Phillips Curve (FPPC), which said that current inflation depended on some measure of the output/unemployment gap and the expected value of current inflation (with a unit coefficient). Expectations of inflation were modelled as some function of past inflation (e.g. adaptive expectations) - at its simplest just one lag in inflation. Therefore in practice inflation depended on lagged inflation and the output gap. After the New Classical revolution came the New Keynesian Phillips Curve (NKPC), which had current inflation depending on some measure of the output/unemployment gap and the expected value of inflation in the next period. If this was combined with adaptive expectations, it would amount to much the same thing as the FPPC, but instead it was normally combined with rational expectations, where agents made their best guess at what inflation would be next period using all relevant information. This would include past inflation, but it would include other things as well, like prospects for output and any official inflation target. 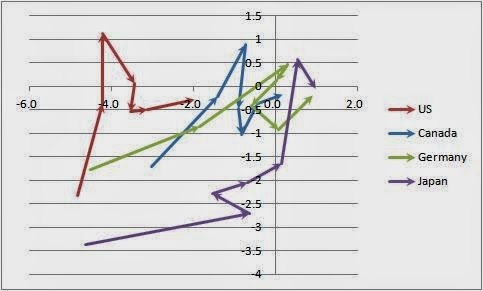 Here is this plot for four countries, using OECD estimates for the output gap on the horizontal axis, consumer price inflation less 2% on the vertical axis, and OECD forecasts for 2014 and 2015. I’ve chosen these countries simply because in most of Europe we had a double dip recession, which is a more complicated experiment. If you do not like the idea of including forecasts, just ignore the last two points for each country. The lines point North East, not South East. This gives more support to the rational expectations NKPC than the adaptive expectations FPPC. To take just one example, US inflation in 2013 is higher than it was in 2009, which is consistent with the NKPC. The traditional FPPC, on the other hand, would suggest that after a string of negative output gaps, US inflation should be a lot lower in 2013 than it was in 2009. OK, now the caveats. Commodity prices will have an important influence on the CPI, and these are not part of either simple Phillips curve story. They may help explain the blip in inflation around 2011 in some countries, but they also helped depress inflation in 2009. Exchange rate changes will also matter. The simple Phillips curve also takes no account of non-linearity caused by a reluctance to cut nominal wages. And of course estimates of the output gap may be wrong. In the case of Japan, we also had a recent increase in the inflation target. This may explain the forecast upward shift in inflation in 2014/5. If it does, that is clear evidence in favour of rational rather than adaptive expectations. All these caveats point to the need to do more empirical analysis. Nevertheless we can see why some more elaborate studies (like this for the US) can claim that recent inflation experience is consistent with the NKPC. It seems much more difficult to square this experience with the traditional adaptive expectations Phillips curve. As I suggested at the beginning, this is really a test of whether rational expectations is a better description of reality than adaptive expectations. But I know the conclusion I draw from the data will upset some people, so I look forward to a more sophisticated empirical analysis showing why I’m wrong. I am not sure that I follow how the model selection is formulated here. Doesn't the FPPC emerge as a special case of the NKPC (i.e. for a particular choice of prior for the agents' beliefs)? It would be nice to look at this in a bit more detail. If you like, what this evidence shows is that such a restriction is not suggested by the data. Yes, at least for the two choices of expectations. Isn't "same as last year" a reasonable choice? As you say on your linked post: "We could probably get any pattern to fit the NK model by imagining a suitable sequence of expectations errors". I am probably going off on a tangent here, but what would reasonable expectations be? PS. Are the two linked articles a reasonable resource to get sufficient background information? I do not think same as last year is a rational choice, when you have an inflation targeting central bank. Assuming that inflation is at target next year is putting too much faith in the central bank, but to ignore the goals of the central bank altogether seems very odd. If you read the linked piece on rational expectations, you will see why I like this as a starting point rather than something simple like the same as last year. But this is ultimately an empirical issue, which is why I though this empirical evidence is interesting. Thanks for the reply. I agree that this is an empirical issue, which is why I think it's interesting to try and infer the actual expectations somehow; even if they might be absurd. This is far from a trivial enterprise of course, and I am not sure how much can be gleaned from aggregated data. PS. I have only gone through the Nason and Smith paper. I find it confusing that they use the expectation operator interchangeably with respect to the probability measure induced by the real process and that of the forecaster. This seems to imply quite strong assumptions, but I am not an economist. Maybe it's something common. I forgot to add that Krugman graphed the US Apr 9, 2014, 'Low Inflation and Structural Illusions (Wonkish)' and put forward that "In fact, I’ve pointed out in the past that if you restrict yourself to Great Moderation-era data, what you seem to find is an old-fashioned, non-accelerationist Phillips curve. Furthermore, recent experience is consistent with that curve...I’d like to see someone do some more formal testing here, estimating Phillips curves on some rolling basis. My strong bet is that the coefficient on lagged inflation, which is forced to be 1 in the Krueger et al work, “wants” to be a lot less than 1 in recent decades." I will have a look at the Ball reference. On the latter, I should have added that Krugman's interpretation can be seen as one of my two polar cases of the NKPC - and I've made this point in the main text as a postscript.